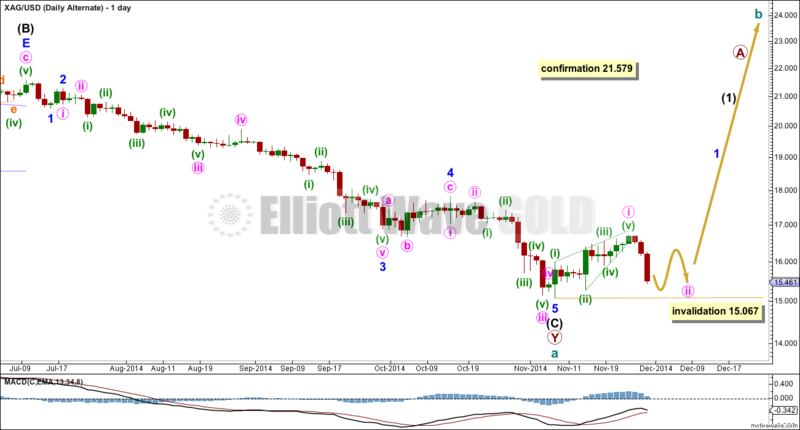 Last Elliott Wave analysis of Silver expected upwards movement which is what has happened. This correction is incomplete. I have a new alternate daily wave count for you. If intermediate wave (C) is incomplete then only minor wave 1 within it is done. Minor wave 2 may not move beyond the end of minor wave 1 above 21.579. Minor wave 2 is most likely to end about the 0.618 Fibonacci ratio of minor wave 1 at 18.812. It should subdivide as a clear three. Within minor wave 2 minute wave a is a completed leading contracting diagonal. Minute wave b is incomplete. If my analysis of minute wave a as a five wave structure is correct then minute wave b may not move beyond the start of minute wave a below 15.067. If this invalidation point is breached then my analysis of minute wave a as a five is wrong and it may have been a three. Silver usually has clear threes and fives, but not always. I am reasonably confident 15.067 will not be breached because the upwards wave fits best and looks like a five. When minute wave b looks like a three on the daily chart then I would expect a five up for minute wave c. When I know where minute wave b ends and minute wave c begins I can calculate a target for upwards movement using the ratio between a and c. I cannot do that yet. By simply moving the degree of labelling within intermediate wave (C) up one degree it is possible that the recent trend change was at cycle degree for Silver. If intermediate wave (C) is over then it was 0.285 longer than 0.382 the length of intermediate wave (A). This works also for GDX, but it does not work for Gold well at all. Because Gold has the greatest volume and so the clearest looking waves I would let Gold lead here, and so I think this alternate idea for both Silver and GDX has a low probability. If any one of these three markets confirms this alternate (in the case of Gold if its wave count is invalidated at the daily chart level) then I would expect a all three markets may have seen a big trend change. Within the new upwards trend no second wave correction may move beyond the start of its first wave below 15.067. 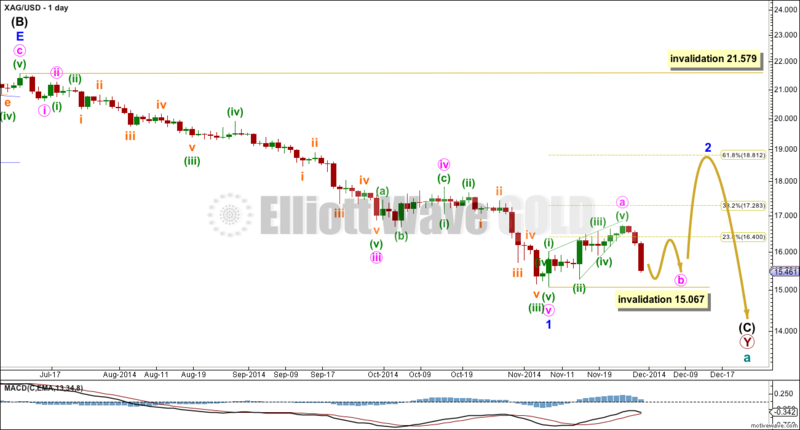 Minute wave ii should unfold further as a clear three on the daily chart. It is probably not over yet, and I would expect it to continue for another two (minimum) or six days. It should be choppy and overlapping, mostly sideways. While this unfolds for Silver and GDX, Gold may be completing its second wave correction and beginning a 1-2 for the start of its third wave up. Silver crashed to way below 15.00 this morning and recovered rapidly to trade at 14.90 as at this moment. Hi Lara. Thanks for updating silver. Unfortunately, spot silver has dropped below your invalidation point at 15.067 a while ago. It went as low as 14.42 and has recovered somewhat. It is currently still below 15.00. Any new alternate to cater to this situation? Could minor 2 in the main wave count be an expanded flat? Yeah, I know. I saw that yesterday. Ugh.